I am sure you'll join me in wishing Ron, our FluffyStuffin blogger, a very Happy Birthday this 31 January. We can't do much for each other, here in cyberspace, where our faces are monitors, our voices are speakers, and our hugs are only virtual, but let's try to think of ways to make a colleague feel cheerier. Believe me, and without revealing any confidences, Ron needs a little cheer right now. Since Ron likes Scarlett Johansson and indeed, Sandy Bullock, why not offer him each a pic of either lady, in whatever poses you can find online. With love and best wishes, Ron, here is my birthday present from afar. On the corner of Douglas Road and US1, here in Miami, can be found this pole, with two stickers on them. But it's the upper-most one, which gave me such a queasy stomach, that I almost slammed the brakes hard in reaction. "9-II was an Inside Job"
I don't think I need further comment about this, do I. By chance, do you happen to see those two modernist structures just at the back: you know, the ones which look like two shipping containers knocked about after a hurricane? Surrounding them, is a fresly-painted green fence, and gorgeously mowed lush green lawn, yes? That's our most prominent ghetto, at least in the Southwest part, in what is called "The Black Grove". 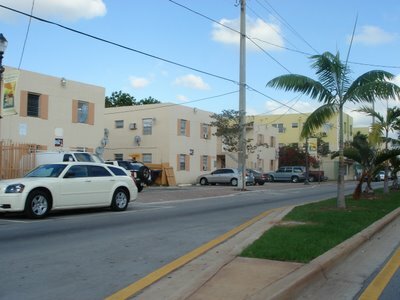 Coconut Grove is a toney suburb of Miami, but it is framed by homesteads settled by Bahamian guest workers from the 1880s-1930s, whose descendants stayed on in Miami. Many of them live in wonderfully renovated, and publicly maintained public housing, which you can glimpse above. But others live in more typical abodes, which pass for rack and ruin in this gorgeous city. Even so, they are painted with the same gay pastels, in the emblematic colours of the city, and have copious amounts of palm trees, all around. How people live in these so-called ghettoes, and yet have really nice cars, and pepper their neighbourhood with Dish Network satellites, is beyond me though. (Perhaps they apply for this subsidy here below, which is the local government centre for welfare mums and dads, located a few feet away from the sticker location above. ...so, maybe we tax-payers are now footing the satellite bill, too. P.S. : I don't think it was an African-American denizen of the Black Grove who put up these stickers, so don't get me wrong. If there is one thing that distinguishes blacks in Miami, from say, blacks around the US, is their political apathy. They vote. 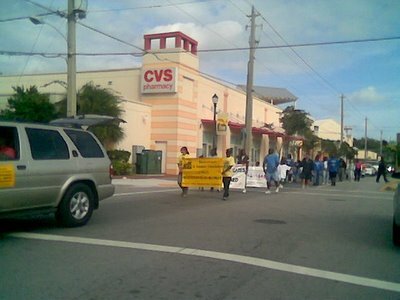 But since the ruinous McDuffie riots in 1980, and the flare-up in 1989, they don't protest. The most they do, is march, like the anti-crime troop past, below. 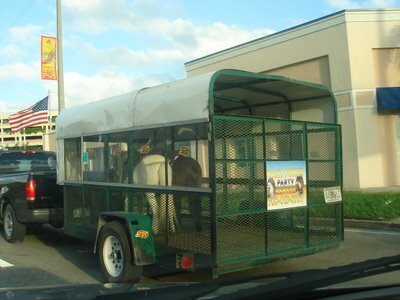 I waved, as I drove past them, and they waved back. 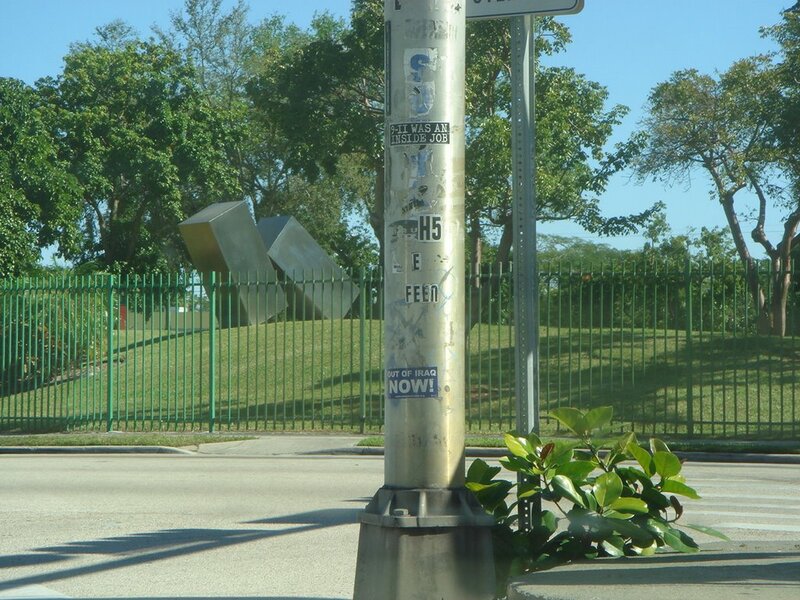 No, chances are the stickers were put up by the yuppy refuseniks in the high-end part of Coconut Grove. 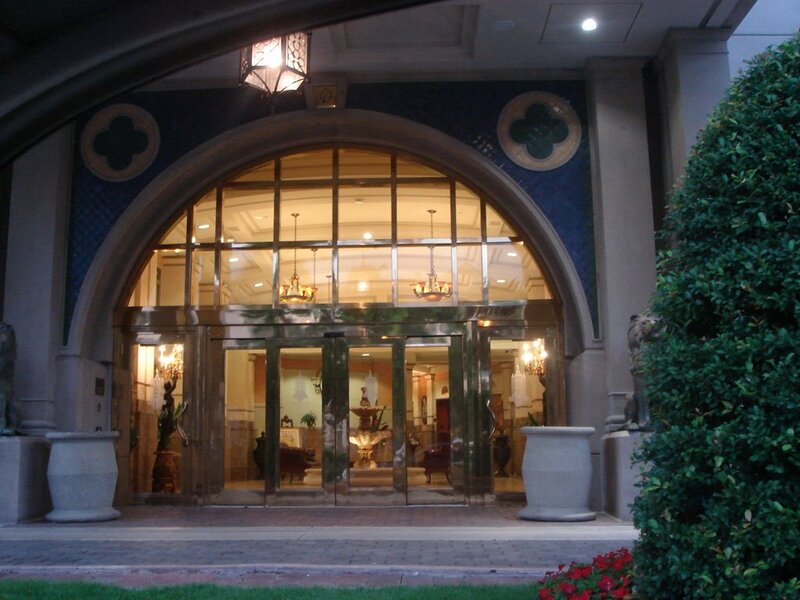 The kind that lives here, in the multi-million dollar gated community known as L'Hermitage. Here is a typical L'Hermitage dweller or guest who, when he turned into the lane I was in, and sped ahead of me, I was able to see the two stickers he had pasted unto his bumper. And the other sticker enjoined us to get this. ...yeah, as if anyone who would ruin the paintwork of an $80,000 automobile, was anything but barmy. I can't say for sure, but if you pressed me, I would say it wasn't the slum-dweller, who is content with his On Demand HDTV, and her marches for neighbourhood safety. It's the millionaire in his two-seater Beemer convertible, yelling his views at the top of his lungs, because that's what happens when you have a sense of entitlement. P.S. 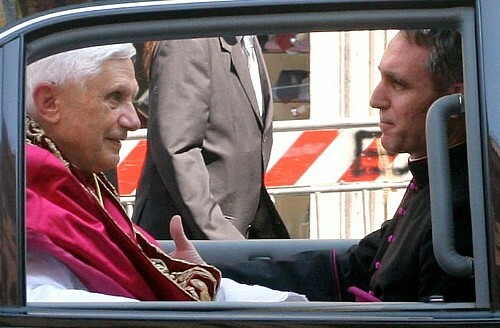 : The handsome and attentive young prelate is actually Pope Benedikt's 50 year-old personal secretary, Monsignor Dr. Georg Gänswein. 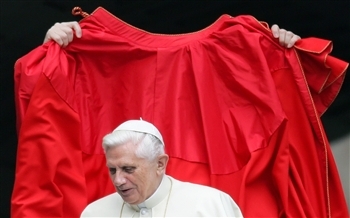 Those red "slippers", traditionally the province of the Popes, but discarded by the husky Pope John Paul II -- the catch is that, of course, this Pope wears Prada. Actually, the Prada shoes story may be bogus as well, the product of fevered media minds trying to drum up, simultaneously, an "homosexual" and "materialist" hypocrite angle, but that he's wearing elegant shoes quite unlike previous Popes, there is no doubt whatsoever. Those at-first-called Gucci sunglasses, which it turns out, are really Serengetti Classic specs. Please, like that's so different. 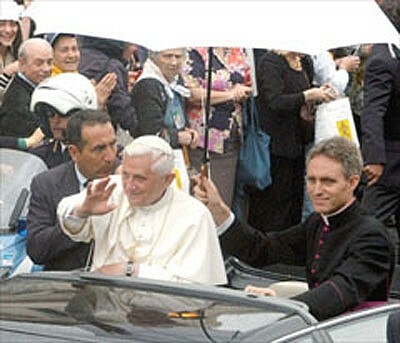 That floppy Nike hat which he was seen wearing, when he and Don Giorgio took their constitutional around Castel Gandolfo. 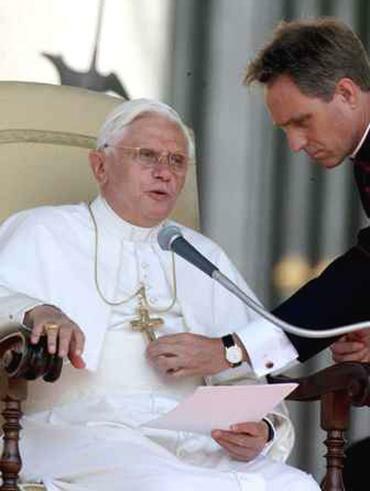 That plain, but stylish Cartier watch which he exchanged for a rather nerdy Timex thingie, when first elected Pontiff. And is there any doubt that the Pope would have taken to his new 2 gig iPod as quickly before, as when receiving counsel from Dr. Gänswein? 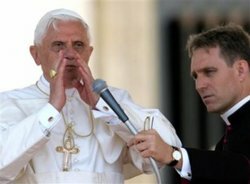 In short, Don Giorgio seems to have the Pope's ear, and not content with that, he's also going for being resident fashionista and general arranger of Pope duds, as well. Not that there's anything wrong with that, in the words of the immortal Voltaire. "Aww, isn't that nice of him. Of course, the Pope has no wife, so what else is he going to do, but have these thoughtful, wifely things done to him by a priest?" Later, she told me she was thinking of the way she combs my dad's hair so that his bald spot doesn't show (as much), something which a wife is supposed to do, she said -- looking out for the welfare of her husband's image, when he himself isn't aware enough to. Ugly minds just don't understand. Are you glowering at me, sky? And leaving behind the day. Here is the "more later" followup promised in yesterday's International Holocaust Remembrance Day post. Miami Beach used to be the retirement mecca for seemingly millions of little old Jewish men and women, back in the 1960s to 1980s. Droves of elderly babushki came from all over the United States -- content to spend out their years rocking in front of hotel porches, all along Collins and Washington Avenues. This is the Miami Beach long-time residents of South Florida recall, more than the flamingo pastels of Miami Vice, or the wild hedonism of the Versace Era. But the problem with the elderly is that they don't last, and South Beach has nearly drained itself of the Jewish pensioner, and thereto, even more distressingly, of the Jewish Holocaust survivor. I recall, as a teenager when I came to visit my parents in Florida, that we would rent a lovely room at the Winterhaven Hotel on Ocean Drive, for a fortnight every summer. And as long as I live, I'll never forget the check-in clerk at the front desk, an elderly man whose hand shook with age, as he handed me the room keys whenever I came back from the beach. One day, when he was extending the keys to me, I saw some lettering or some such, on his wrist. With all the innocence of the child I still was, I exclaimed, "Oh, you have a tattoo!". Like a sailor, I thought. Drawing himself up as if slapped, he drew back his shirt cuff, and turned to me, nodding. No words. But a look of such heart-numbing pain, that I can never erase it from my memory as long as I live. In front of me, stood a man of indeterminate age, originally from Poland, now working in exchange for his lodging in the top floor at a Miami Beach hotel, but once when he had been exactly my age, he survived Auschwitz. A litany of such 20th century monstrosity that it beggars the modern mind, to say it out loud. Being half-German, I have a special duty, an earnest consciousness, and an overwhelming desire to remember what can never be forgotten by Man. ...because certain moments cannot be jollied up. They cannot be trivialised, if they are to mean SOMETHING. 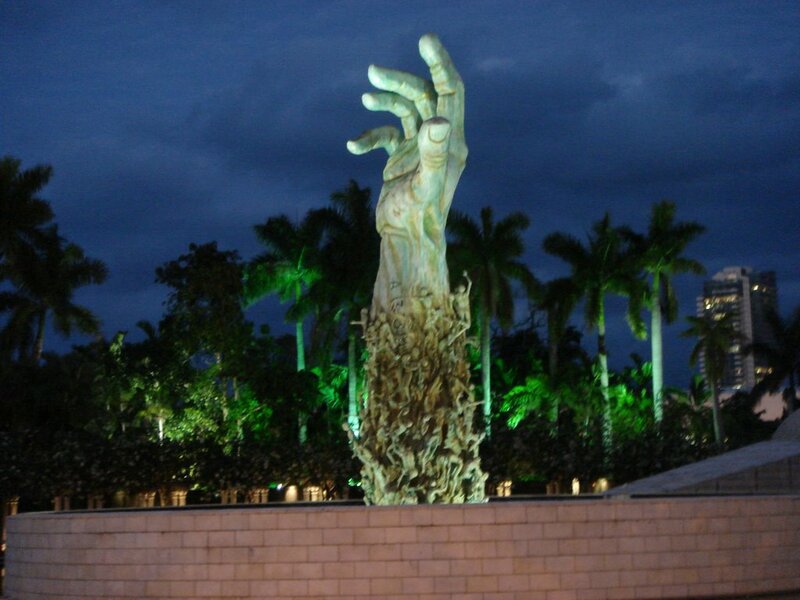 Many South Floridians don't even know the Jewish Holocaust Memorial exists. Oh, maybe they do, in the way one knows there is a Miami Seaquarium or Monkey Jungle -- tourist destinations you somehow push to the back of your mind, far removed from your daily life, unless you live near it, and thus, one of the most moving sights of Miami/Miami Beach, is completely unknown to millions of its residents. How can you miss it? 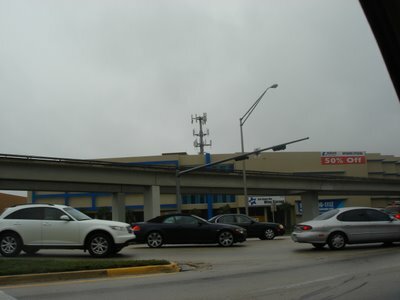 As you pull into Meridian Avenue, there it is, immense, imposing, unforgettable. 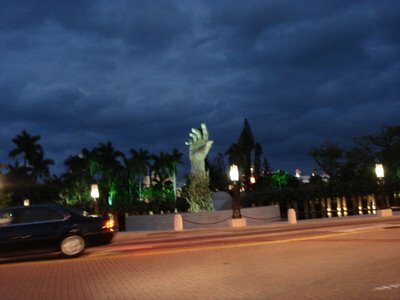 I went there at night, and not the daytime, because in my humble opinion, this Michelangeloesque upraised hand in cast bronze, is at its most awe-inspiring with the setting sun behind it. And when the skies have been threatening to open all day long, with menacing clouds above, I can't even explain to you the shades of inky blue that form a backdrop behind it. Even this startling photograph, does not do the scene justice. As you approach the memorial, one of the first sculptures you will see in this park, is that of a mother gathering within the folds of her skirts, her two young children. I need not tell you that this is precisely what happened, a million times over, during the Holocaust, as parents and children faced the ultimate fear -- fear of the gathering storm of hate. But inscribed on the wall just behind Mother and Children, are the words of Anne Frank. "That in spite of everything I still believe that people are really good at heart." I have a confession to make to you: I suffer from Stendahl's Syndrome. When Stendahl went to Naples, back in the mid-1800s, he was overwhelmed by the statuary, the monuments and reliquaries to be seen in such abundance in Italy. His pulse raced, he became dizzy, and he often observed others in exactly the same predicament. I almost fainted when I approached the David statue, and though I was told by my parents it's a common enough occurence (a psychological reaction to seeing a well-known face or work of art, right in front of you, which can overwhelm a person), I didn't want to tell them that I was just scared of David's enormous proportions. I had the exact same reaction to this towering hand, which as you can see, is well over 20 feet in size. But I bit my lips, and carried on, cognisant that I was taking photographs of The Sculpture of Love and Anguish, as it's properly called, not just for me, but for all of you. So, thanks Sundries readers, for making me face, and conquer at least this one fear. After all, when you think of what the statue represents, how absolutely ridiculous are any of our niggly fears compared to it. I think the architects who designed this pond-framed statue, understood instinctively that it was a powerful, perhaps too powerful monument, and consequently, sealed it off by a moat, and surrounded it by an open-air walkway called The Garden of Meditation. I cannot tell you how pretty, how inviting, and peaceful it is. 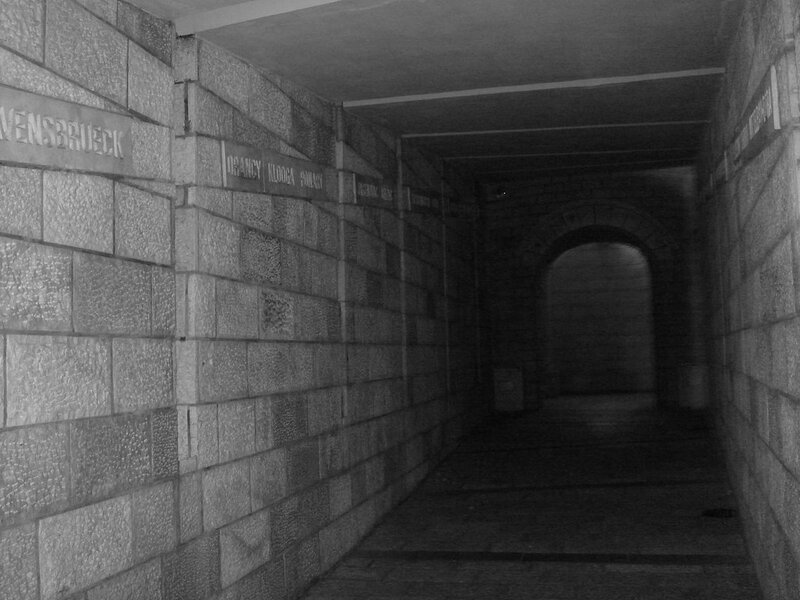 You have to come down here, and see it yourself one day. 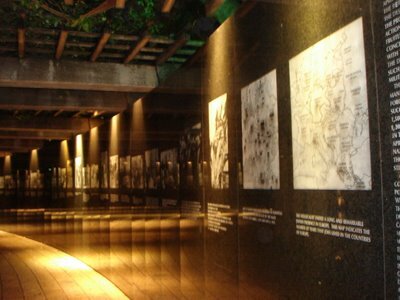 Jerusalem has Yad Vashem. I've been told by many friends who have been there, that the experience is almost claustrophobic in intensity. 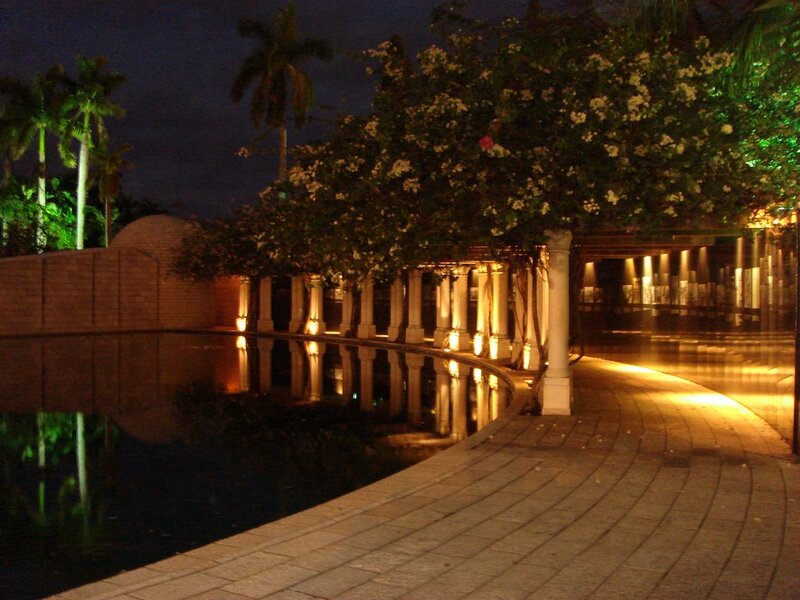 But our flowery trellis path here in the Miami Beach version liberates the spirit, free to gulp the horrible significance of its gorgeous black granite slabs -- that which contains the visual and historical memories of the Holocaust. As you continue walking along its reflecting testimonials, you begin to prepare yourself for something a little more sombre, a little more emotional, than the peeping flowers and moonlit sky offer above. 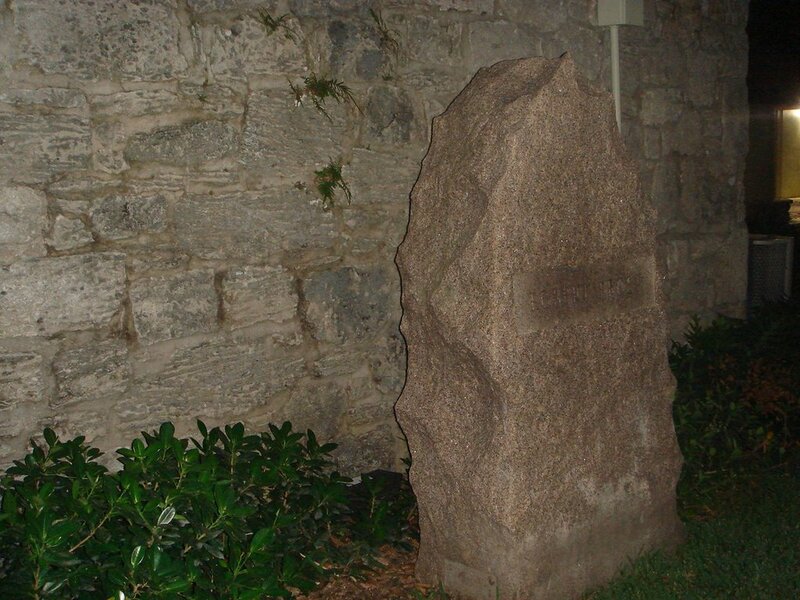 Perhaps the JFK grave in Arlington has made all Eternal Flames mere copy-cats, but when you see this flame, licked by the cheery Florida wind right and left, you know it's absolutely fitting to see it there. 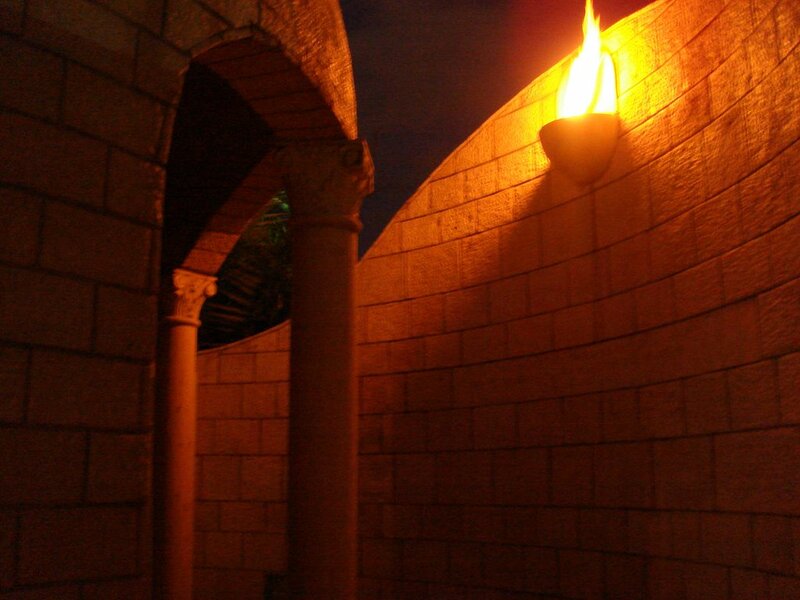 I shot the Eternal Flame without flash, just as you would see it were you to approach it yourself. 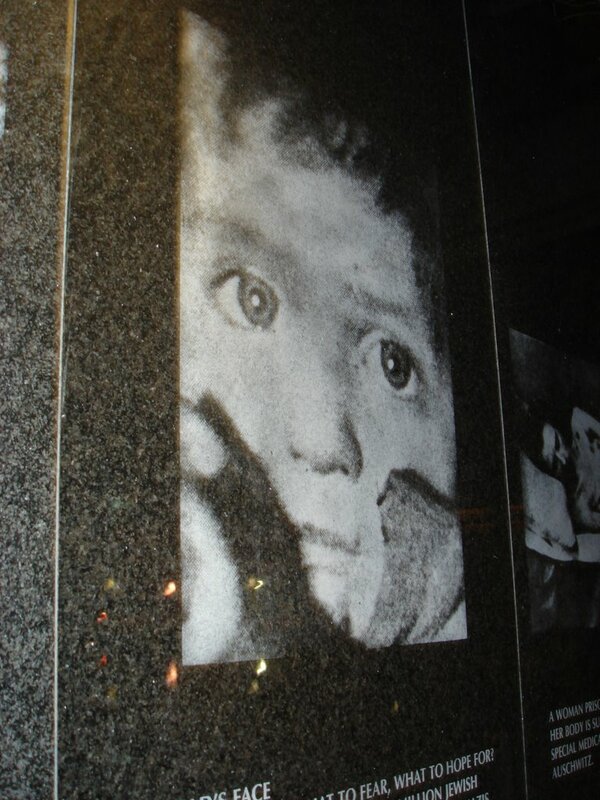 But the images of the Holocaust are also imprinted on our collective memories in black and white, so here is a Youtube link, with the flame flickering to the sound of children's voices. 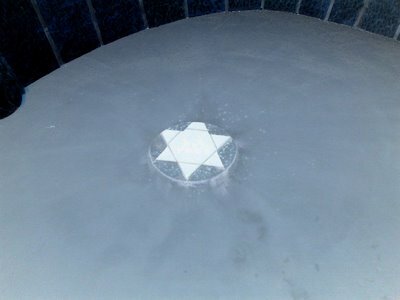 ...like this stark, horrible image of the JUDE inside a Magen David, above. The yellow cloth Star of David, a new kind of brand for a new-old kind of genocide. The long, narrow road to the concentration camps, to the open pits, to the firing squads, to the cattle cars, and finally, into the gas chambers were walked by each person who died there. It is called The Lonely Path, and I knew I had to come at night, to see it. In the sunlight, it's almost cheery Jerusalem pink stone walls give it a different feel entirely. But at night, with the songs of children representing innocent life about to die, well, let's just say, there is a reason my hand was unsteady as I shot the footage below. And here it is, just a few feet away. What does the structure represent, you ask? It is said that every memorial visitor has a different interpretation. 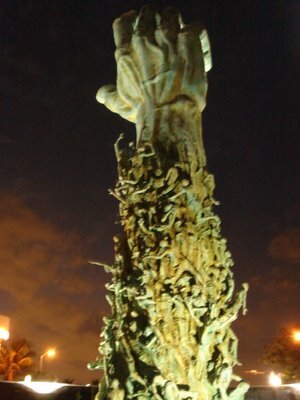 On face value, it represents the hand of a Holocaust victim -- with number tattoo near the wrist -- lifting itself to the heavens, being weighted by dozens of figures of men, women and children, all around it. 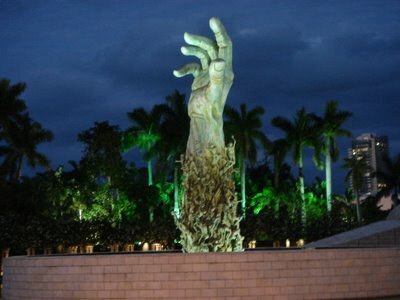 Would you be offended if I told you that to me, it represents the hand of God? 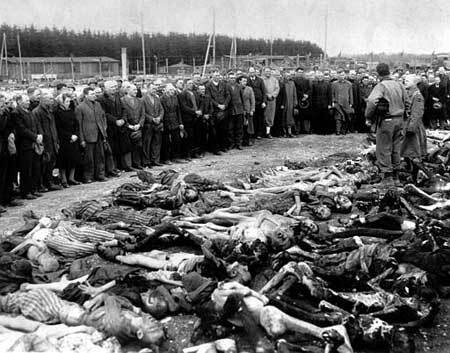 Many Holocaust survivors and those who read of it, believe that such incidents as the Showa are proof positive that there is no such entity as God. How can there be a God, when He allows such unbelievable evil to exist? I don't know. I can only tell you what is in my heart. ...that they must NEVER FORGET ITS LESSONS. That to forget is to allow evil a chance in the world. That we do forget, time and time again, is our real human tragedy. God bless all those who perished in this and other Holocausts. May we be strong to face hate, and to fight it wherever it raises a hand to smite us. January 27 is International Holocaust Remembrance Day. And the words "Never Again" can only mean something if they are followed by "Never Forget". Years ago, I had an automobile accident which still haunts my dreams. In slow-motion, I can see my car being broadsided by the right (another lady driver, an illegal from Colombia, without insurance...). I can hear that awful c-r-u-n-c-h of glass imploding and metal collapsing. And I can conjure up visions of me inside the car, desperately and yet with an ethereal calm that still fascinates me, manoeuvering the steering wheel to safety towards the shoulder OF THE LANE ON THE OTHER SIDE OF THE ROAD, alive, but aged a decade in experience, in seconds. I remember thinking to myself, even before I got out of the car, God, it's rush hour on an extremely busy road. How did I not hit or get hit full on, by an oncoming car? 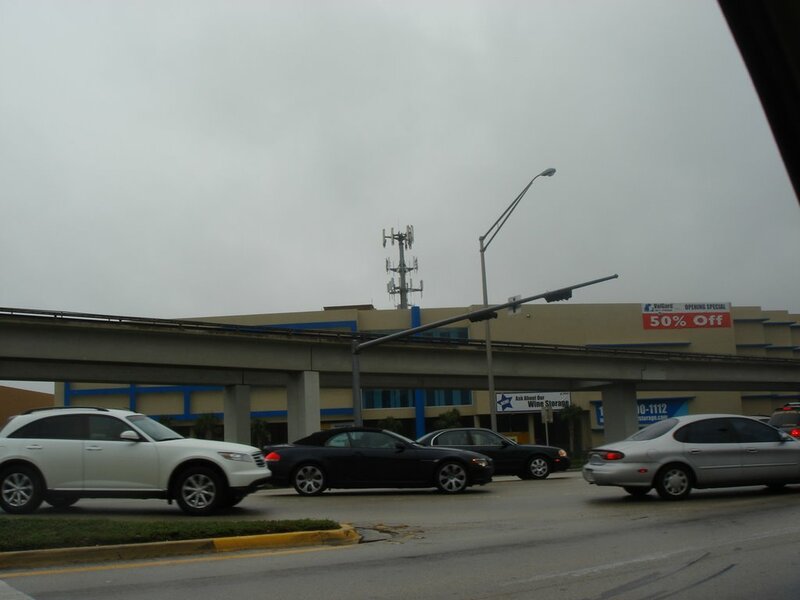 There I was, today, sitting in my car on the 878 ramp going east, about to enter the weird residential highway we call South Dixie Highway (better known to other Americans as US-1). The light changed green, I slowly accelerated and with no traffic coming behind me, I did something I have never done, and hope never to do again. My car did a complete, utter 360 turn, for no reason at all. I just sat holding the wheel with a death-grip, trying to steer it "right" again. As soon as I righted the car, I pulled over and checked the tyres. Nothing. Three of them, at least, are brand-new. I pulled in meekly into a full service garage, and had them check the automatic steering fluid. Full up. To the moment that I am writing this, I have NO idea why my car decided to go postal on me; even the fact that it was piddling down today, and cold, doesn't explain how one can do a 360 turn, going from 0 to 20 mph, just like that. But I still had chores to do for my parents, going here and there, as my mother is too busy taking care of my father, to do what she normally does for him -- so I drove on. That was around one in the afternoon. Later that day, around five, I happened to find myself on the opposite side of the 878 expressway, watching the cars turn as I did, just a few hours ago. ...I was damned lucky not to have had this traffic behind me, at the moment that I spun around. Else I surely would've totaled my car -- or worse. P.S. : No, those aren't my skid marks. Obviously, there are some other blogposts out there, telling a similar tale. I am starting a new travellogue tradition on Sundries, as of today. Whereas before I offered up shots which sometimes were grainy at best, now you can see South Florida in all its elegant aquatints and overlooked corners, as it is in real life. You have to forgive this debut travellogue. It has more than the whiff of the amateur about it, rather than the original shots I think I proffered to you before. As I aquaint myself with my new camera, with its many apertures, macros and hidden menus, it will yield more intriguing snaps, than these almost pro-forma shots below. Nevertheless, I hope you enjoy this latest traipse around this mignon, "New Antique" city where I now live. What I lack in proficiency, I think I more than make up for in enthusiasm! 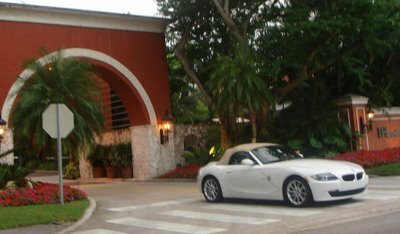 We start our travellogue in Miami's most beautiful neighbourhood, the Mayfair or Park Avenue-equivalent called Coral Gables. You know, it takes a visionary to imagine swampland, Banyan trees and dense humidity turning into anything as beautiful as Coral Gables, and that's precisely what it took. 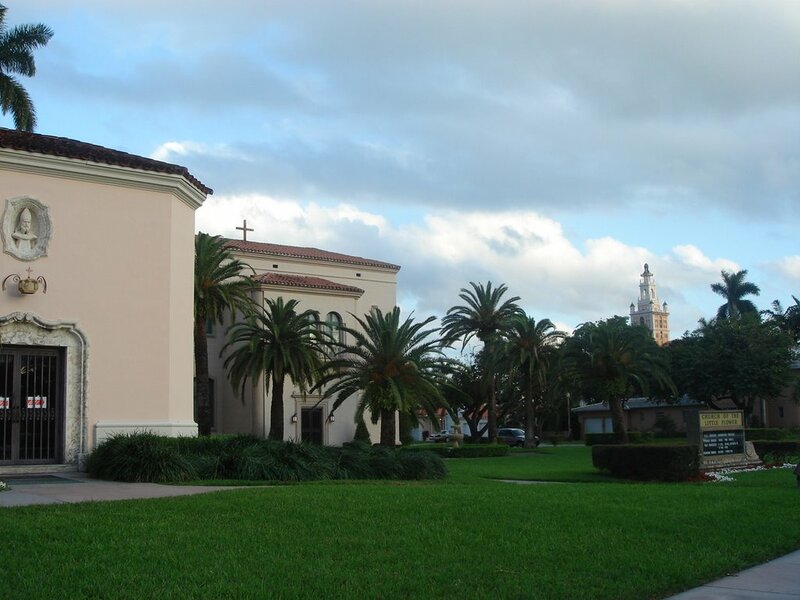 Coral Gables was founded by a pioneer of the highest order, a Pennsylvanian named George Merrick. It was he and his family who braved this mosquito-heaven that later became the soignée, Spanish colonial chocolate box of a planned community. And you know when that was? 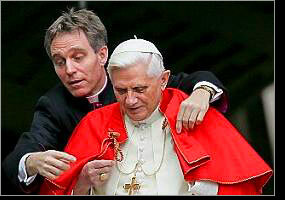 Why, that's just two years older than the age of the current Pope! A mere eyeblink in history -- but for Florida, it might as well have been 200 years ago. Named, of course, for Hernando De Soto, the Conquistador of Peru. The DeSoto fountain right now is undergoing repairs, as you can see. UPDATE: Via Stuck On the Palmetto, here is a picture postcard of the DeSoto Fountain as it was back in the day. Check out how suburban sprawl has blocked the view of the Biltmore completely. In fact, many Coral Gables landmarks are having a major face-lift, which is no mean feat, considering that their express purpose is to look aged. 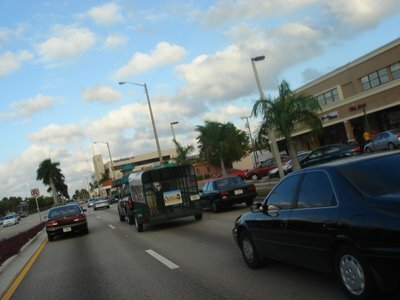 I recall that it was amongst the very first views I had of Miami, when I first came down here, and the mere fact that it is a traffic circle, as Americans call a roundabout, made me instantly less homesick. 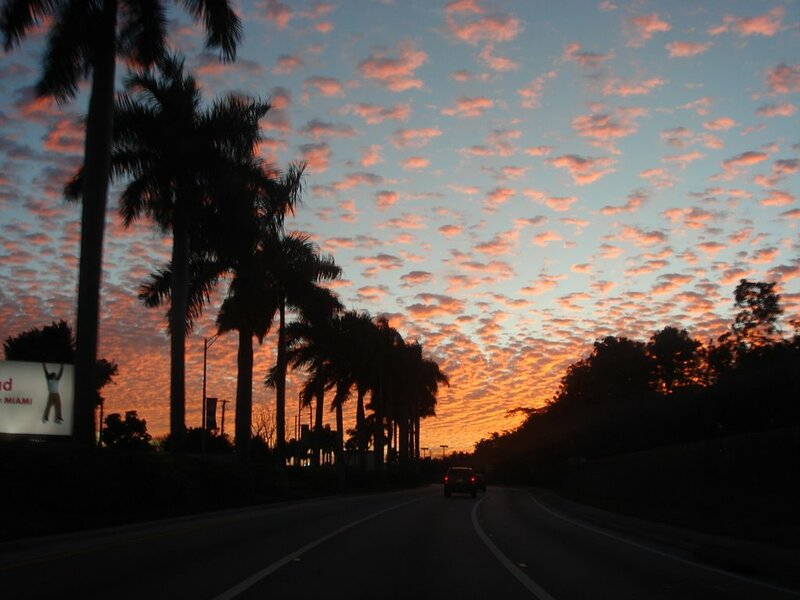 Not that Miamians know how to negotiate a roundabout at rush hour, but never mind, at least the view whilst you wait, is delightful. From the DeSoto Fountain, you hit the piece de resistance of all Coral Gables' landmarks -- the Biltmore Hotel. I have a whole, complete travellogue planned about this magnificent edifice, so I'll just whet your appetite by saying that if you beg one of the hotel porters to take you up to the tower you see, right above, you'll see the "Duke and Duchess of Windsor Suite" in its full glory. Presidents Reagan, Bush 41, Clinton, and Bush 43 have all stayed in this Suite, which is closed to the general public. Even the Brazil National Team with Ronaldo and Rivaldo were not allowed to visit it, but with my feminine wiles, I got to peek inside courtesy of my new bellhop friend. I asked later, if there were any amusing anecdotes about the Biltmore, that they could tell me. There were. 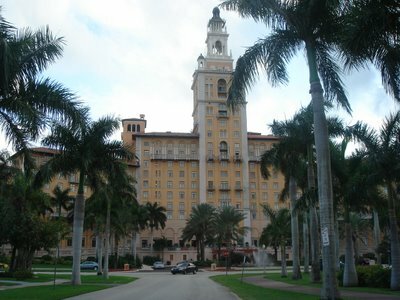 Prince Philip's father, Prince Andrew of Greece and his brother, Prince Nicholas, both stayed as guests of the Biltmore Hotel when it first opened in the mid-1920s. And being part of the rowdy Danish Royal Family, famous for its pranks and high-spirits, it was said that the Princes took to riding bicycles up and down the corridors, and inside the ornate lobby, nobody daring to stop them. As for the Duke of Windsor, one of his old Palm Beach cronies (a grand lady who was my father's patient in the early 1980s) told me that at night the Duke would amuse himself, having knocked back a few Chivas Regals, take a shotgun, and blow out the lights in his suite's enormous, imported chandelier. Being notoriously cheap, I wonder if he paid for the damages. Methinks not. It's good to be the ex-King. 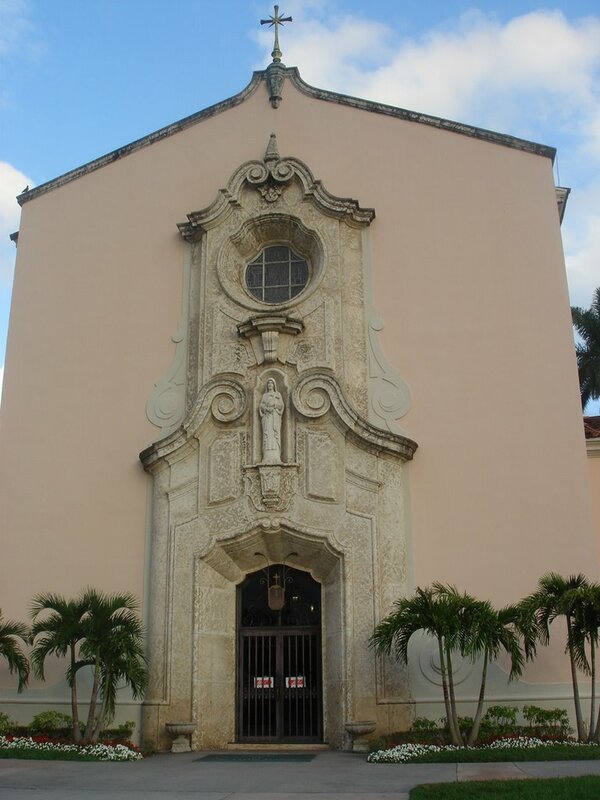 Just opposite the Biltmore, is the lovely Coral Gables Congregational Church, which has the honour of being the first church built within the city confines, in 1923. Years ago, I attended a book signing there by Edvard Radzinksi, the eccentric Russian biographer of the Romanov Imperial Family. When I went up to get my copy autographed, he said, "Vat is your name? 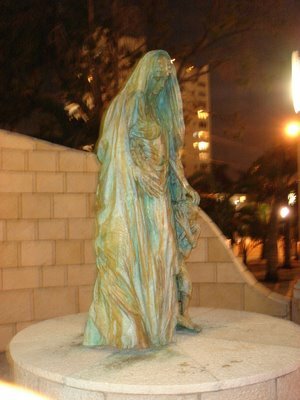 ", "Victoria". "Ahh, very royal name. Never change it." Slightly taken aback, all I could utter was, "Thank you. I won't." 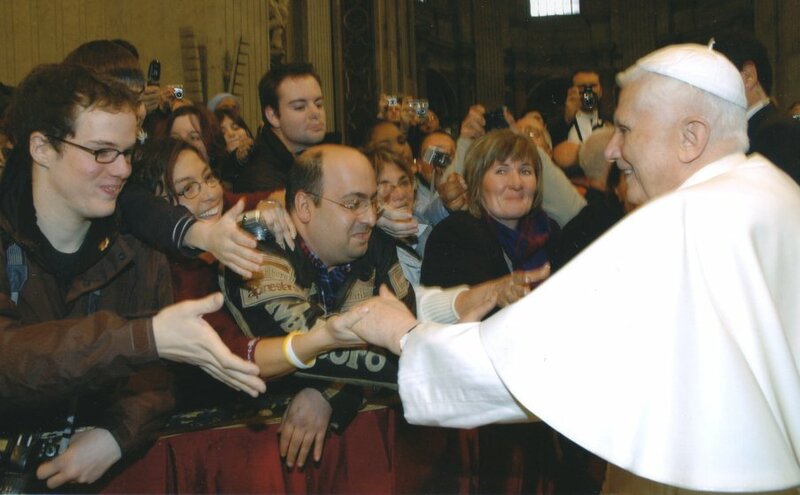 And with that, he gave me a little flourish, and a kiss on my right hand. As he bent down, his curly, red hairpiece nearly fell at my feet. 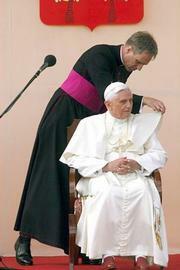 From that day onward, I have called it The Toupée Church. I'm sure it doesn't mind. Congregationalists are all very well, but I am Roman Catholic and just a stone's throw away from the Biltmore and the Toupée Church is exquisite Church Of The Little Flower. My whole family are devoted to this gentle, loving nun known as the Little Flower, St. Thèrése of Lisieux, who wrote that she could only offer to make the world better, one small step and gesture at a time. She was the embodiment that you didn't have to live an amazing life to contribute to God's creations. You just gave as much as you could, paving a path known as The Little Way. When her relics made their United States tour, I was there at this Church to pray next to the small, ornate but yet unostentatious ossuary, which holds her remains. Due to my foreign birth, I have not decided where I shall be married, whether in London, or in my bridgegroom's hometown, or in the US. 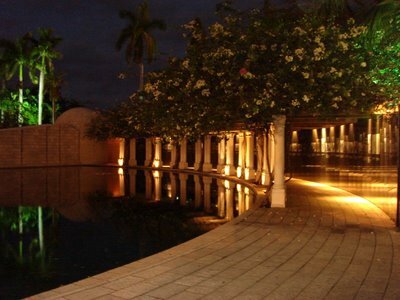 But you can be sure, if I do marry here in South Florida, this is where my marriage will be consecrated. If I do have the blessing of being married at the Church of the Little Flower, I won't have to hunt around for a suitably elegant reception hall. Look what edifice is peeping from behind the Rectory. I might even take a page from Prince Andrew, and bicycle over in my wedding gown. As you have noted, Coral Gables and Spanish colonial are tied at the hip. 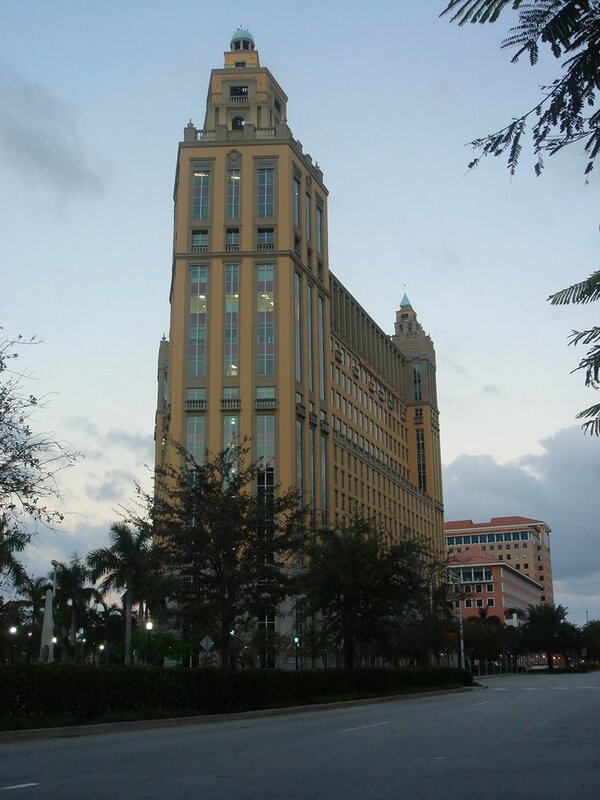 In fact, I have the fortune of being in love with the two dominant architectural styles this city embodies -- that and the Art Deco of Miami Beach. The lines are clean, dramatic but it is not ashamed to be ornate when it's called to be. 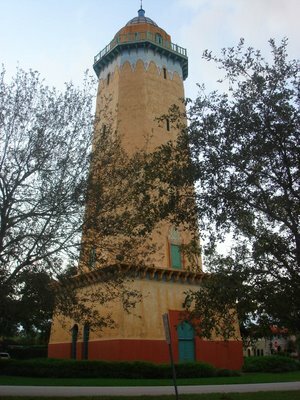 This is what this lovely tower represents to me -- the so-called Alhambra Water Tower. Back when Merrick was building his homestead, there was no conduit to safe drinking water anywhere, but Lake Okeechobee, well over 100 miles away. As you can imagine, this was very expensive for a fledgling city. 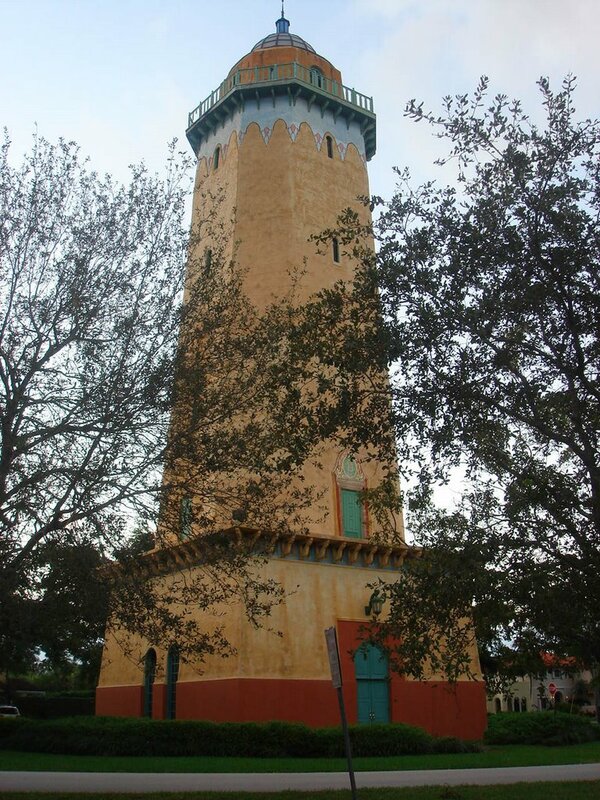 So they built this Water Tower in the Moorish style, to provide sustenance to its small, hardy local community. 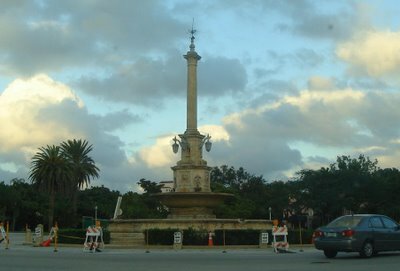 Many years later, and though its purpose has long been superceded, it stands there like a beacon to all in Coral Gables -- with all the cheekiness of a lighthouse, and none of its perilous drawbacks. The colours in daylight are phenomenal, its minaret-style keyholes teasingly drawing your eyes to them, and though I took the snap at dusk, you can still see the burnt mustard glow and sparkle, just over the trees. 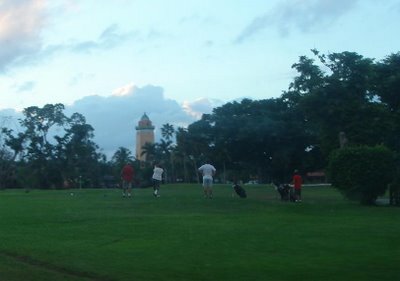 I often aimed for the Water Tower, playing on the 6th hole at nearby Granada Golf Course. But Coral Gables isn't all faked epochs and too-cute architecture. The newer structures have more than a little bit of late 20th century muscle about them, which throws the more colonial elements scampering underneath the Señora's skirts. Unlike New York City, we don't have a Flat Iron building. For one, we don't lack space down here in South Florida, so we don't require its hunched elbow lines. But that didn't stop the good people who built the jutting edifice known as the Alhambra Towers. And for my money, it has the most beautiful lobby in all of the city, which specialises in pretty lobbies. Night has fallen, and I traipse back home, deciding to make a detour through downtown Miami. There will be more detailed travellogues about this oft-depressed area of Miami, which vibrates in the morning to the beat of a thousand bankers' footsteps, but dies a lonely death after 6 o'clock every day -- but just a glimpse for now, of my favourite theatre in the area. The one, the only, the incomparable Gusman Theatre for the Performing Arts -- the recently re-named, Olympia. Inside it's a real, honest-to-goodness American moviepalace, (seen here in daylight) complete with fobs, gold leaf, marble banisters and that unforgettable decor redolent of the 1920s, when movies were the best show in town. 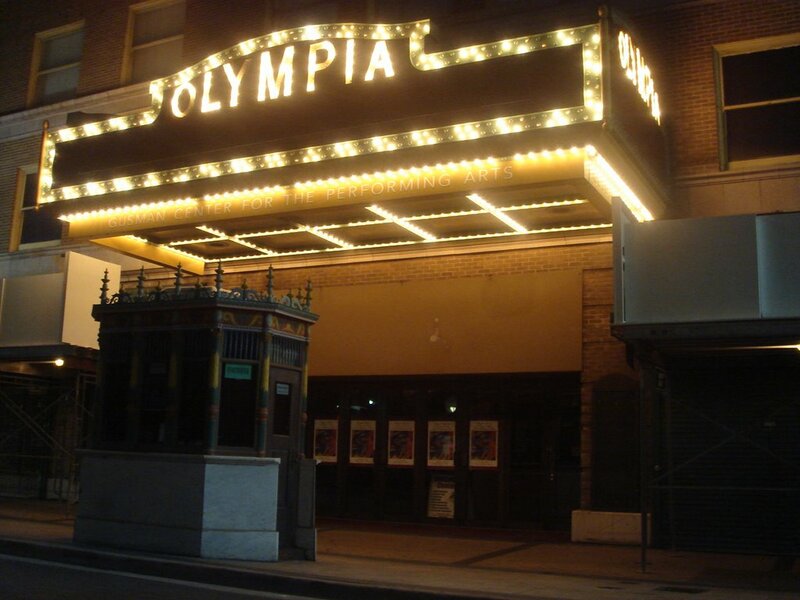 Check out the old-fashioned box office kiosk which stands OUTSIDE the theatre, still the scourge of patrons during dark, rainy evenings when there's a show or Miami Film Festival movie on. Of course, the best thing about it, is that Maurice Gusman, the millionaire whose cultural munificence to the city is without name, I recently read was a "rubber baron", whose main product were condoms. He made a KILLING supplying the Army rubbers for American GIs in two World Wars. It's wonderful symmetry this, considering how many children must have been conceived in the dark alcoves of many a moviepalace. Hope you enjoyed our little foray into South Florida. FREEBIE: The Palm Court Fountain, at the University of Miami's main campus in Coral Gables, where I had a Dolce Vita moment once. Suddenly, you turn the corner at the University of Miami's main campus, in Coral Gables, when you see this tombstone jutting out at you. 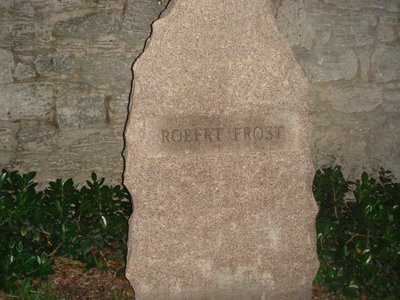 You don't know why someone saw fit to place a deadly tribute in the middle of this leafy, elite campus, and thus intrigued, you edge closer to see who it is. Did he keel over at UM, perhaps of heat prostration when walking to the Ashe Building? Miami is full of such unexplained oddities, which I can say without a hint of irony in this case, are without rhyme nor reason. P.S. : When I showed my mother these photographs, she startled me in the way parents have sometimes, of revealing something about their childhood, you had never heard before. 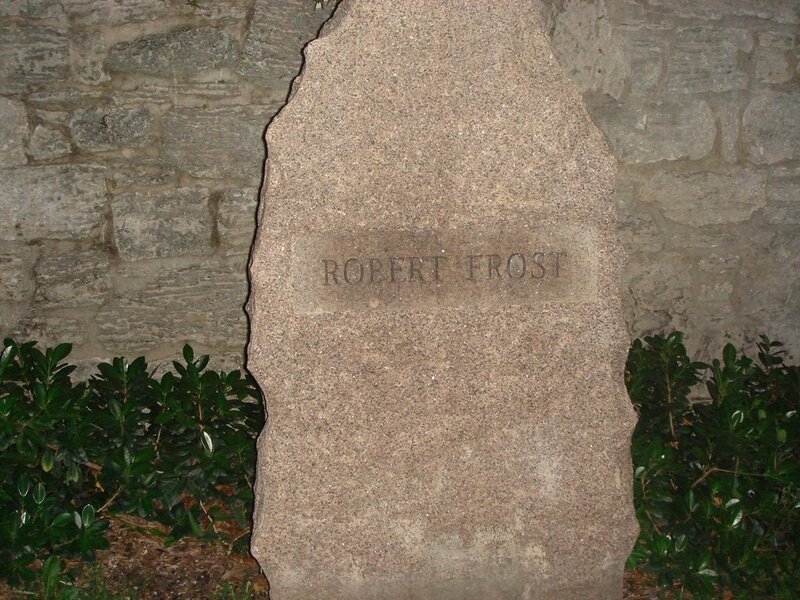 "Robert Frost? Did you know that in high school [she went to Salem, in Baden-Württemberg], I won the Robert Frost poem recitation prize?" "Yes. First prize was a trip to the US consulate, where they gave me peanut butter sandwiches and Coke with ice. I was in heaven." When one of my oldest friends, whom I have known since I was sent to school in the US, for 11th grade, and my exact contemporary, told me she was expecting her 7th child, I did what many people would do upon hearing this: congratulate her warmly, at the same time wince in mini-horror. Already the mother of 6, with one on the way! Her sister with 7 of her own, to boot! This unusual, modern state-of-affairs is probably why I was intrigued enough to watch Monday's TLC channel programme, 16 Kids and Moving, about Arkansas' Duggar family. Here they are, in their Sunday finery and fruitful glory. 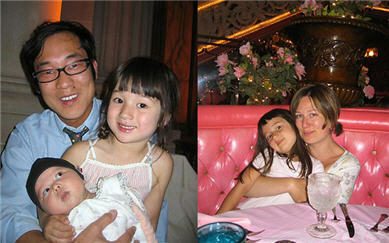 As pretty, healthy, preternaturally wholesome family as you'll ever see, I'm sure you'll concur. And every last child with a name starting with the letter "J" too! An hommage to realtor dad, "Jim Bob" Duggar, perhaps (who looks like he could be one of President Carter's sons). For foreigners such as me, the name Jim Bob is instantly evocative of the Waltons. The smirk factor, especially for us Brits, just keeps piling up. 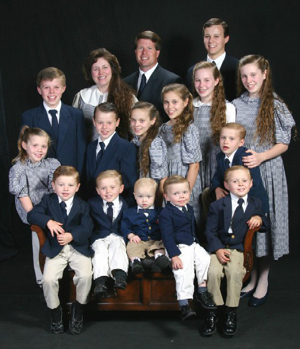 Looking at this picture-perfect, devoutly Christian, and doubtlessly conservative family with their gingham dresses, and high-and-tight haircuts, is almost scary. It's the American Myth come to life, for foreigners. The myth of the American Superman, who does everything at a scale which dwarves other nations, even those who in the recent past, were all that and a bucket of buffalo wings themselves. In the Old World, having 16 kids today is almost like declaring yourself a Martian come to take over the world. Or something infinitely worse -- being a peasant. The truth of the matter is, most people in Europe couldn't fathom having sixteen kids because it takes work, organisation, dedication, and self-abnegation which perhaps today, is only possible by virtue of a good dose of religiosity. The kind of person that pups out 16 children, isn't exactly a coward, or afraid of back-breaking work. And we won't even talk of being optimistic! And then of course, we Europeans know one thing, and we know it well. Having loads of kids is expensive. VERY expensive. Why the French have kept to a strict 2 children average cap since before the time of Napoleon. You think they'd sacrifice their lifestyles NOW, when Club Med at Cap d'Antibes is beckoning?? But it's also true that having sixteen children is not any the less astonishing in the past, as it is now. Even in my generously-sized family on BOTH sides, the top procreators only ever reached 14 children back in the 1850s (astonishingly, only one died before reaching his 20th year). I recall hearing that the village vicar would mention their names, immediately after the Royal Family's, in prayerful intercession for bearing up so well for such a large-sized family! In Western Europe, having multiple children is either a sign of craziness, or of religious fervour or of being incredibly low-class -- both of which might as well amount to the same thing, according to the intelligentsia. But in the US...well, I rather thought things would be a little different. Of course, my friend has told me the stares she and her sister, and parents get, when the whole family goes out to dinner at say, the Outback. 13 kids, two sets of grandparents, and one Italian great-grandmother ain't easy to navigate in and out of two mini-vans. And sitting down to eat takes the military expertise of Field Marshall Montgomery. More than one person, says my friend, looks at the family and mouths insults under their breaths. "God, look at them. Bringing all these kids into the world. Almost obscene! Get contraceptives, fer chrissakes!" ...one lady said, not under her breath, as the family traipsed by. That hurts them more than I can say, because though my friend attended my toney Catholic all-girl's school, she was a blue-collar scholarship girl -- and the family struggled, then and now, to make end's meet. But they do. And without a lick of help from the government. We won't even mention that both she and her sister have only had one husband each, who are the fathers of all their children, and are the only bread-winners of their families -- one, a handyman, the other, a graphic artist. Similar, in fact, to the Duggars (and the Heppners, the family TLC portrayed just before this programme. They also had 16 kids). I suppose to people who have made different life choices, and accept help from many quarters (in and of itself, not a matter of shame -- though it highlights the sacrifice of others, who don't), find this resentful. It's the compare-and-contrast that hurts. If one set of parents can, why can't they? Well, there are no easy answers to that. Some can, and some can't. It's about character, and circumstance meeting each other, I suppose. And that hurts too. In researching the Duggars, I found myself reading an Op-Ed piece about them, from an unlikely source -- a contributor to the San Franscisco Gate. From the title, to the opening lines, to the closing lines, it's a piece of writing that drips with venom, biliously corrosive venom that eats from within, and perhaps, astonishingly, something infinitely worse. I read it, and I felt so very sorry not only for the Duggars, who must be the targets of such constant put-downs for being nothing more than themselves, but for the person who wrote it -- because he sounds like the poorest human being alive. Arkansas mom gives birth to a whole freakin' baseball team. How deeply should you cringe? "Who are you to suggest that her equally troubling husband -- whose name is, of course, Jim Bob and he's hankerin' to be a Republican senator and try not to wince in sociopolitical pain when you say that -- isn't more than a little numb to the real world, and that bringing 16 hungry mewling attention-deprived kids (and she wants more! Yay!) into this exhausted world zips right by "touching" and races right past "disturbing" and lurches its way, heaving and gasping and sweating from the karmic armpits, straight into "Oh my God, what the hell is wrong with you people?" The writer, Mark Moford, continues. His screed ends with this pea-green nugget. Here it is. In all its misshapen, emotionally stunted glory. A person who lets his frustration for all the things he resents take over his sanity, his charity, his fellowship to others, just to melt away under his furnace blast of hate. It's the Christian angle. It's the Republican angle. It's the homosexual angle. It's the white angle. Heck, it's even the Southern angle, and quite a few angles besides, which I didn't get, since I took remedial Geometry. If this family had been sharecroppers, valiantly raising their kids on 40 acres and a mule's labour, the fangs would have never appeared. If it had been a gay couple who graduated from the Mia Farrow School of Maternity and adopted 16 kids, they would've been awarded the freedom of the City of San Francisco. If it had been a desperate Mexican immigrant couple, raising 16 kids in East LA, hosannas would've been said for their predicament. 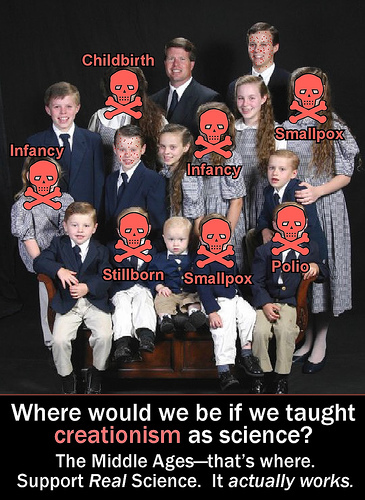 But for the Duggars, with their 16 "kidbots", there is nothing but contempt. Instantly I think about my friend, who struggles to feed, clothe and homeschool her 6 kids. I even think of my great-great-grandfather Tommy, a modest country doctor, often paid in chickens by his humble patients. When did being a decent, large, godfearing family, become the equivalent of being freaks? I can only come to one conclusion, sadly. I suppose it occured when the real freaks took over. P.S. : I'm having 2 children, maybe 4. But as a young only child, I dreamt of having 9, non-gimmicky named kids. Why, if my childhood heroine, Nadia Comaneci, can become a mum at the age of 44 for the first time, maybe I too can be pushing out my future perfect 10s, well into my forties. And if I hear one wisecrack as I pass by, I swear, I'll flatten them with my Pampers bag. ADDENDUM: I've received more than my fair share of email about this post, and see that the Duggar's situation, hits close to the knuckle for some people. Now, if those opposed to the Duggar's enormous fecundity were to stop at "My God, isn't it too much for two people to have 16 kids?" or thoughts to that effect, I think most of us wouldn't blink twice, and some who even appreciate folks like the Duggars, might even agree. But oh no -- they don't stop at that. And THIS vitriol that the Duggars engender, is what I find utterly fascinating/repulsive. I found this blogpiece by one Kelly Garbato, on our Duggar Family. The blogger apparently has written about the topic before. Now, don’t get me wrong; I don’t have anything new to say on the subject. I still feel the same way now as I did last October. The godbaggers are just getting on the nerves as of late. Add to the mix the recent blog brawls between parents and non-parents, Xian mommies and heathen mommies, and mommies who think even their kids’ poo is special and those who simply loathe their little toeheads, and, well, I’m sick of hearing, talking, and even thinking about the Christian (mini-) Country that is the Duggar Family. Babies, religion, fundamentalism, blecht. It’s enough to make one half of a sterilized atheist couple puke. And remember the photo above? Here's another version. These people are so full of hate. And there but for the grace of God, indolence, and too much credit card debt, go I.
I was raised to think by my liberal-70s parents that life choices are not to be denigrated, because who are you, to do so? It's been one of my DEEPEST sorrows to find out that those who share my parents' generation's ideals, and those they have influenced after them, have such nastiness, such bigotry, and such fanaticism inside their hearts, that whatever noble impulses they started out with, has long been overridden by the singularity, the zero-sum game of their world view. To be sure, they're not the only ones, and you can find hypocrites on the dexter side as well. But Conservatives are not the ones who pride themselves on being the ALTERNATIVE to the status quo. You know -- the ones with the humane ideals? I'm closest to the Boston accent? I presume more Beacon Hill, than Southie. When I went there to visit an ex-boyfriend who attended Boston College at the time, I was chatting to a British guy with the odd name of "Chip" in his dormitory. Turned out he was Senator Saltonstall's great-grandson. Still, I do a mean Southern accent, and not for nothing, is the greatest incarnation of Southern gentlewomanhood an Englishwoman -- Vivien Leigh. But it seems I'm more pahk the cah in Hahvahd yahd than Fiddle-dee-dee. There you are, one day. Driving around on a beautiful Sunday afternoon. You're talking on the mobile (naughty habit, but you dare to, because traffic is light), perhaps a little downbeat, when something catches your eye. You can't quite see it. But you know it's unusual. What could it be? 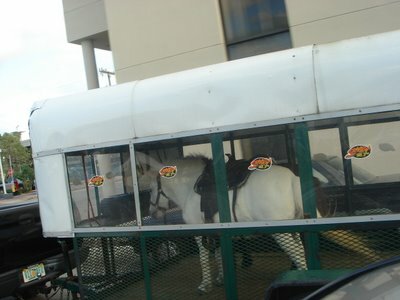 Seems like an odd little U-Haul trailer. Wait, is that movement inside? Ponies!! Two cute, sweet little ponies! Riding on a highway! For rental yet. Now, I don't know about you, but my parents gave me an 8th birthday party that I'll never forget. I had clowns (hated it). I had balloons and a helium machine (s'okay, got to hear my dad in a Mickey Mouse voice). I had that ice-cream red cake with vanilla icing (mm-mmm). And being a thoughtful hostess, yes even at that tender age, I had thank you presents for the kids who showed up (baby ducklings, one per household). But the piece de resistance, the make-em-or-break-em of any kiddie party, were the pony and trap rides! To this day, I can see my 8 year-old self on that pony, a little white sweatheart of a patient beast -- and am transported into such a joy, that it instantly feels like having your feet tickled. "Well, yeah, I stalked out, in a snit, and was driving around for a while, a bit depressed. Hmm? Yeah, it happens, we're all a little down sometimes, OH MY GOD A PONY!!" What, weren't you 8 ever before? This is fantastic, and similar to the Padre de Familia skit in Spanish below, it's a comedy hour "comedienne" riffing the Iron Lady. If you're lost in Spanish, don't worry, just enjoy the sights and especially sounds. "Mira, las Malvinas, yo no sabia que teniamos ningunas islas. Que yo supiera nadie me habia dicho na'a. Y mas, tan lejos! Pero las invadieron, y hostiasssss las senti muy mias. Pero esto que, me van a tocar el bolo los Argentinos estos. Digo, no me los van a tocar! Empeze una guerra, y la termine, y la GANÉ!". LOL! PRICELESS. Who is this person?? ADDENDUM: Oh, not again. Remember when some idiot altered the Pope's Wikipedia entry? UPDATE: Seconds later, it's not there anymore. Whew, Wikipedia editors must be working round-the-clock. User-composed Wikipedia articles are one of the best things in the internet. It shows that there is a LOT of knowledge out there, held by people who would not traditionally contribute to its dessimination. These types of asinine activities ruin it for all of us, because the obvious reaction will be to close these entries down from being stupidly altered by men and women who never really grew up. 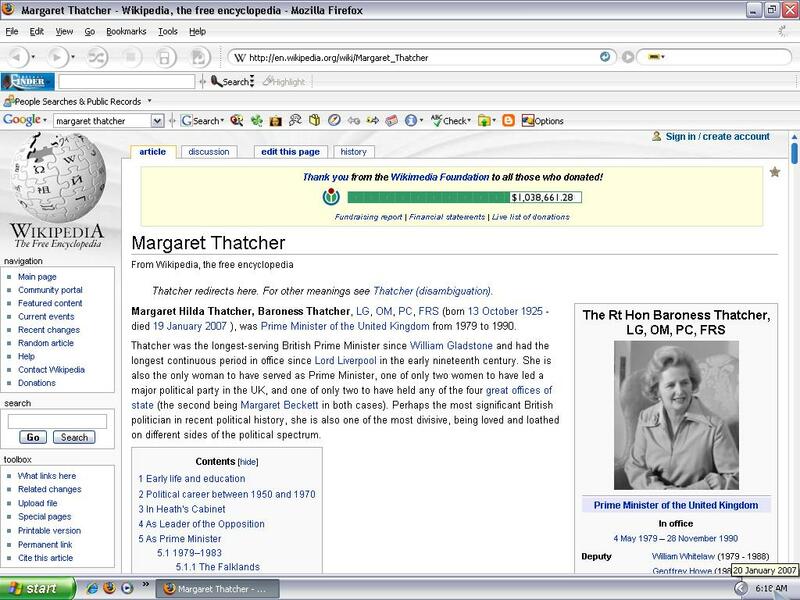 Note, it's only SOME people who get this Wikijacking treatment. Now, what could they have in common, pray? Of course, this guy never gets his entry altered...though something tells me, we'll be updating it REAL soon. More patience, I beg of you, my dear, increasingly few readers. The good news is that there is a travellogue coming to a blog near you, soon. Promise. I made my parents allow me a little breathing room this weekend (since I have been doing stuff for them, all this week), with this purpose in mind! More later. P.S. : I saw Letters from Iwo Jima tonight, and can recommend it to you without qualms, having liked it -- certainly much more than Flags of Our Fathers. However, my friend and I were in an half-empty auditorium, never a good sign on opening night Friday, so I don't think this film will get a lot of tread. Ah well. 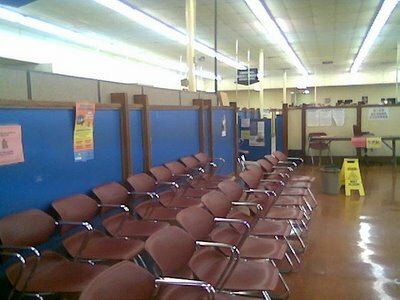 Still a bit busy, since we're having new wall-to-wall carpet installed next week, but I will be back soon. In the meantime, for your bemusement, I offer you this never-to-be-forgotten Family Guy episode. Good stuff, huh? The creator behind the idea -- now on French television -- the French Russell Simmons if you will, is Jamel Debbouze, a Frenchman of Moroccan ancestry. If you think he's making out like an one-armed bandit monetarily, it's because he is. He lost his arm as a kid on a train track, and he's become a multimillionaire due to his club. Boom tish! Don't worry, he'd be the first one to laugh at my feeble joke, because he has a SENSE OF HUMOUR. And anyway, the French are all about laughing, and the yucks, as we know. Look at Dunkirk. Wasn't it that monstre sacré, Jean-Jacques Rousseau, who said, "Take my chains, please!"? Now, I've recently mentioned in my Borat analysis post, how I think that we British are possibly the worst enabled to mimic American stand-up. Our wit is not based on their rat-ta-ta-tat diction, and cruel one-liners, but slowly processed and solitarily digested quips which keep on giving, the more you think about them. Hardly the stuff of a 15-minute skit about vaginas monologues and how Ray-Ray stole his new 22"s.
And though the French do much better with their lightning quick patter, in terms of stand-up timing, they still resemble kids let out from school telling their mates the latest joke about la Madame juive with le gros cul on the 3rd floor. Check out the (rare, white) French dude making with the political jokes, at Chirac's expense. French comedy used to mean something very incisive, something very deep, something almost beyond the intellectual (when the intellect meets ideals, in the case of Molière, Montaigne, and Zola), which transcends the moment, despite the universality of its message. It is the ultimate merger of style AND substance. The French language is primed for such reveries, precisely because it's malleable, yet strict; welcoming, yet frosty. It has structure, and grace in abundance, yet lets you play with it, like a lover. And I hate to tell my French friends this, but when you start copying Americans, you lose. It's true of French cinema and its ridiculous Galliwood efforts like Vidocq (the French revolution murder mystery western! ), and it's true of French stand-up. "Are you ready! Are you REGGAE! Que longtemps! Faire le maximum de bruit pour Dédo!" I don't exactly know when this comedy fails, but it's missing something. A certain -- come on, you think I would type that? I think the word I am searching for is, the undefineable, exquisite, and very French "esprit" -- so what happened? They copied. That's what happened. Give Back Your Person Of The Year Award! Why wasn't James Kim made Person of the Year in 2006, by Time Magazine? Hmm? Instead, a generic "You" received the increasingly disregarded award, which prompted the hilarious comment from sometime co-blogger Renato, that screw it, he's going to include that in his Curriculum Vitae. I understand that Time Magazine probably wanted to award "You, The American Voter" for voting for the right party at long last, as the arch-vulgarian Roseanne Barr said on Larry King -- possibly refraining from being so obvious, at the last minute. If James Kim, who paid the ultimate sacrifice doing what is the quintessential action of a REAL man (trying to save and protect his little family), is not worthy of such an award, then screw it, neither am I. God rest his soul. More men like that, we need on this earth. So on that note, I am giving my Time Person Of The Year Award, back. Someone get me Sacheen Littlefeather's cellphone number. Here are my picks for the 2007 Golden Globes! WINNER: BABEL!! (7 out of 10! Not too shabby) I am not displeased since it showed the power of international cinema, at its best. Anyone who has seen the abysmal film, "One Day In Europe" knows that a multi-story pic with intersecting themes, is no mean feat to get right. 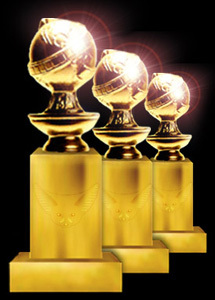 Right, ladies and gents, I'm off to sleep, perchance to dream of my own Golden Globe one day. I'm a lock for Best Mouth Who Can't Shut Up And Doesn't Want To. WINNER: Helen Mirren! (7 out of 10, with 8 defined) She gave an almost unacceptably short acceptance speech, which she must polish for the 1 billion Oscar night viewers in March. Although she modestly thought that the audience had fallen in love with the real Queen, I can tell you, no Helen, we adored YOU FOR YOUR SAKE -- Heh. Which echoes the central theme of that film, of course. WINNER: Eddie Murphy! (Still 2 out of 10, with 3 categories defined) Not too shabby. It seems that the Globes are big on Dreamgirls, and perhaps this will see them through to the Oscars. Eddie looked great in black on black, which is difficult to do, as Jamie Foxx can tell you. He has also sold his soul to the devil, because he hasn't aged a whit since his SNL days. WINNER: Meryl Streep! (2 out of 10) Who else, but the most consummate actress of her generation (Gena Rowlands being the greatest American actress still alive). She is saying what everyone knows, that 2006 was an excellent year for 'gal' movies, and she's right. Great line: "I think I've worked with everyone in this room". WINNER: Jennifer Hudson! (1 out of 10, so far) She gave a gracious speech, and her newly-toned physique and face looked very refined. Shame about Rinko, but not undeserved win by this ex-American Idol. WINNER: Marty! (4 out of 10, with 5 categories defined) Great stuff, though you all have to check out Infernal Affairs, which is even better than The Departed. Nevertheless, I think it was a stroke of genius to have situated this in Boston, with its Irish/Italian dynamic. I think Martin Scorsese will win the Oscar this year, too. Oops, Devils with Dirty Faces comment fell like a clump. WINNER: Letters From Iwo Jima! (3 out of 10, with 4 categories defined). I knew it. In fairness to what can be seen as this American win in a bizarre "Foreign" category, so far the Golden Globes has been a love-fest for Brits. Helen Mirren, Hugh Laurie, Bill Nighy, Emily Blunt, Jeremy Irons, and the poxy Peter Morgan with a Dubya allusion. I'm sad for Pan's Labyrinth, though. Still, good one Clint. Here's the rest of the balloting. For my money, this past year 2006 has been amongst the best years in recent times, for terrific pure acting. But as has been mentioned in my other film-centric posts -- it's been a very bad year for GREAT FILMS. Two exceptions are Children of Men (not even nominated! A travesty), and Pan's Labyrinth, which has been shunted off to the Best Foreign Film category -- in fairness, that way it stands an excellent chance of winning, since Almodóvar has won before, and the votes might be divided enough between he and Eastwood. I liked Leonardo Di Caprio in both Blood Diamond and The Departed, but his performance was middling at best compared to one of the finest performances by character actor, Forest Whitaker. I won't even mention Ryan Gosling in Half-Nelson, and Edward Norton in The Painted Veil, both of whom got shafted at the Globes this year. Just about the only lock is Helen Mirren. Her performance was likewise, one for the ages. Remember, the Academy are much more conservative than the Golden Globes, so anything can happen on the night. Let's see how right or wrong I am, come Monday.